"The Selection changed America Singer's life in ways she never could have imagined. 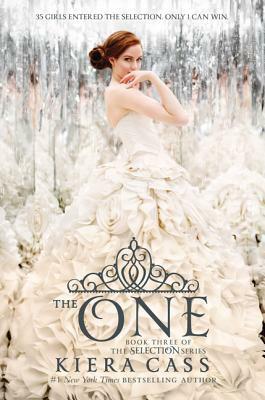 Since she entered the competition to become the next princess of Illéa, America has struggled with her feelings for her first love, Aspen—and her growing attraction to Prince Maxon. Now she's made her choice . . . and she's prepared to fight for the future she wants. Thank goodness for this final installment saving the series for me! Although I was not all that enthused with The Elite (The Selection #2) I felt like the series did a 180 and got back on track with The One as it got more serious, less gushy, and America was more bold. America! I’m so proud that she finally realized that being in the middle of a poorly fulfilled love triangle isn’t the most important thing to fret over! In The One, she takes charge, and although she doesn’t have the best laid out plans, her natural ability to do the right, and just, thing under pressure is golden. I feel like something happened in between The Elite and The One, because in this book she’s really quite definite about her own selection decision, and every now and again she has to remind herself to let the other guy down. I feel like she could have easily nipped that in the bud early on, but understood that it was necessary to keep a different type of suspense going throughout the book. I loved the suspense of the rebels, and how the changes in Illéa were progressing. Adding elements of grief, action and anxiety greatly contributed towards my satisfaction with The One. You could feel the tension between King Clarkson and America! He continues to put America in compromising situations and just sits back and smiles at his plans. Even though times seemed unbearable, embarrassing and down-right humiliating, America stood her ground and I’m pleased she never gave up, or in. The whole thing seemed a little fast paced, though, and that was probably an effort to redeem what was lost in the previous book. I also felt that, although I was all smiles with outcome of the novel, it was very predictable and for these reasons alone, is why I gave it four stars. The Selection series started off with a bang, fizzled a little in the middle, but then blazed up in the end. If you were frustrated with The Elite, I plead that you go ahead and finish off the series with The One! You won’t be disappointed!